In the two-plus years that Football Relativity has existed, the most popular post we’ve ever done is our Coaching Trees research project. It has shown up in more searches and led to as much discussion as anything we’ve ever done. In this project, we broke down the influences of all the NFL head coaches to determine what the most prominent coaching trees were. Pete Carroll – Carroll has bounced around enough that he’s hard to categorize. In many ways, a lot of his success is due to Monte Kiffin and Earle Bruce, whom he coached under in college. He coached under Bud Grant and then Jerry Burns with the Vikings and then worked as Bruce Coslet’s defensive coordinator with the Jets before succeeding Coslet as head coach. After the Jets jettisoned him, Carroll went to work for George Seifert in San Francisco and then became coach of the Patriots. Of course, Carroll rebuilt his career with a great run at USC before moving to the Seahawks. We’ve included Carroll in the coaching tree of Grant and Burns, since they were the first ones to give him an NFL shot. Chan Gailey – The career of Gailey, now head coach of the Bills, is a strange one, with key stops at then-Division II Troy State and also in the old World League of American Football. His last stop before getting his first head-coaching chance in Dallas was as the offensive coordinator in Pittsburgh under Bill Cowher, but we’ve included Gailey under his first NFL boss, Dan Reeves, whom Gailey worked for in Denver. We made that determination since Gailey is far more known for his offensive play-calling prowess than for his Cowher-esque defensive approach. Perry Fewell – Fewell was only an interim head coach in Buffalo, but his repeated presence as a head-coach interviewee makes him worth including in this exercise. Fewell started his coaching career in college and got his first pro shot in Jacksonville, but it was Lovie Smith who gave him his best opportunity in St. Louis and Chicago. Since then, Fewell has been a coordinator in Buffalo and with the Giants, in addition to his interim chance with the Bills. He is the first branch off Lovie Smith, which makes him part of the massive Tony Dungy tree. Leslie Frazier – We were tempted to include Frazier (and a couple of fellow 2011 hires) under Mike Ditka’s tree, since he (and Ron Rivera and Jim Harbaugh) all played for Da Coach. But instead, we’ve included Frazier under the Andy Reid tree. Frazier’s career started as head coach of Division III Trinity College, and then he coached at the University of Illinois. Then Reid brought Frazier in as the Eagles’ defensive backs coach. After four years in Philadelphia, Frazier got his first coordinator’s job with the Bengals under Marvin Lewis. Frazier also worked for Tony Dungy as the Colts’ DB coach before moving to Minnesota as Brad Childress’ defensive coordinator. Since Childress comes from Reid’s tree as well, we believe that this is the most appropriate place to include Frazier on our coaching tree chart. Ron Rivera – Rivera, like Frazier, played for the 1985 Bears, and his first shot at coaching was as a quality control coach for the Bears. But like Frazier, his first chance as an NFL position coach came in 1999 with the Eagles, when Andy Reid was hired. Both Frazier and Rivera learned from the late Jim Johnson at that time. After five years with the Eagles, Rivera moved back to Chicago to be Lovie Smith’s defensive coordinator, but Rivera and Smith never meshed in terms of defensive style. 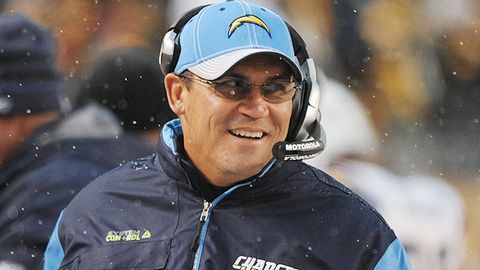 That led Rivera to San Diego, where he worked as linebackers coach and then was promoted to spend three years as defensive coordinator under Norv Turner. We’re including Rivera, like Frazier, under the Andy Reid tree, and with both additions Johnson gets a nod for being a defensive influence. Jim Harbaugh – Harbaugh played in the NFL for years, entering the league with the Bears under Mike Ditka before playing key roles in San Diego and Indianapolis. But his NFL coaching experience is limited to two years as the quarterback coach in Oakland under Bill Callahan after Jon Gruden left. Harbaugh then became a college coach before joining the 49ers this offseason. 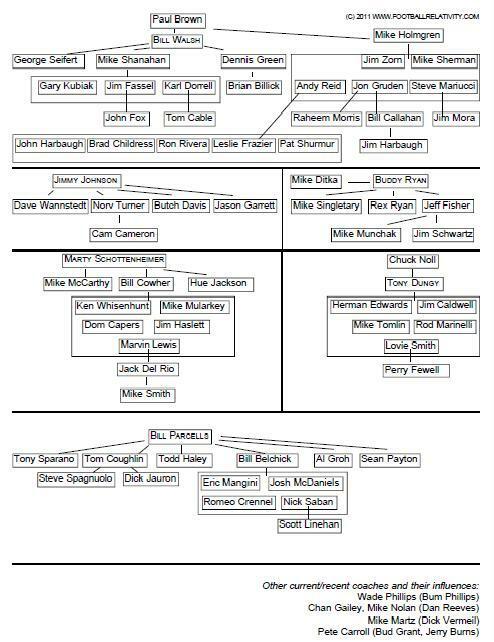 In truth, Harbaugh should be under his father Jack’s tree, but since we didn’t include his brother John there, we’ve added Callahan and then Harbaugh under Jon Gruden in the Mike Holmgren branch of the Bill Walsh tree. Jason Garrett – As a coach, Garrett has worked for Nick Saban with the Dolphins and Wade Phillips with the Cowboys. But in many ways, he already had his offensive identity before working for either coach. So we’ve included Garrett in the tree of Jimmy Johnson, for whom he played for seven years in Dallas. Garrett was the prototypical third quarterback – a player-coach who seemed to know the offensive inside and out, which gave him the ability to keep things straight despite inferior physical talent for an NFL quarterback. At first glance, that’s what helped Garrett develop his coaching style, and so we put inside Johnson’s tree. Pat Shurmur – Shurmur comes from a coaching family (his uncle Fritz was a long-time NFL defensive coordinator), but his coaching legacy falls under Andy Reid. After eight years as a college assistant under Nick Saban at Michigan State (and one more year at Stanford), Shurmur spent 10 years as quarterbacks coach under Reid. He got a promotion to move to St. Louis as offensive coordinator, which is where he got the Cleveland Browns job. Since Shurmur was hired for his West Coast offense credentials, he naturally fits as an offshoot of Reid more than Saban. Hue Jackson – Jackson spent 14 years as a college coach before Marty Schottenheimer gave him his first pro shot as the running backs coach with the Redskins in 2001. Schottenheimer lasted just one year in Washington, but Jackson stayed under Steve Spurrier and got the offensive coordinator in Spurrier’s second year. Jackson then moved to Cincinnati as the wide receivers coach and then to Atlanta as the offensive coordinator in Bobby Petrino’s single season there. From there, he went to Baltimore as the quarterbacks coach and then to Oakland as the offensive coordinator, before the Raiders promoted him to head coach. Given Jackson’s nomadic career, we’ll include him in the Schottenheimer tree since Marty gave him his first pro opportunity. Mike Munchak – Munchak, the new Titans coach, has spent his entire career with the Oilers/Titans franchise, first as a Hall of Fame player, and then as an assistant coach. And the Oilers/Titans had just one coach during that time – Jeff Fisher. So Munchak joins Jim Schwartz as a branch off of the Fisher tree, which falls under the Buddy Ryan tree. We put these hires through the theory of relativity. We’ll do it on a 10-point scale, with 10 being the best possible hire, and 1 being the worst possible hire. While the hires are pretty tightly bunched right now, we’ll still break them down on our scale. 10 – Leslie Frazier, Vikings – Frazier earned the Vikings’ permanent coaching job after going 3-3 as the interim head coach. Given the crazy circumstances Minnesota faced over the end of the year – a collapsed stadium, two postponed games, one rescheduled game, Brett Favre’s drama, and a third-string quarterback starting, 3-3 was a good result. Frazier has long been a respected defensive coordinator, and he had seven head-coaching interviews before finally landing a job. He’s an excellent defensive backs coach who has had success as a coordinator with the Bengals and Vikings. Frazier has what you want in a head coach – a steady hand, a great relationship with players, and good motivational skills. But he’s stepping into a difficult situation. The Vikings are getting old at a lot of key positions, and they don’t have a quarterback of the present or the future on the roster, unless Joe Webb’s development hits overdrive. Plus, the stadium situation in Minnesota opens the door to a lot of uncertainty and perhaps even a move by the team. So Frazier isn’t getting a plum job. But despite the negative history of interim head coaches over the last two decades, we believe in Frazier, and believe he’s positioned to succeed as a head coach. 7 – Jim Harbaugh, 49ers – Harbaugh was the hottest coaching prospect in America this year, with at least four NFL options – San Francisco, Denver, Miami, and Carolina – before him, as well as the high-profile job at his alma mater Michigan. After a series of interviews, Harbaugh decided that his gold mine was with the 49ers. It’s easy to see why Harbaugh was so highly regarded by NFL teams. After entering the NFL as a first-round pick, Harbaugh played for 15 years, starting 140 games for the Bears, Colts, Ravens, and Chargers. He’s also the son of the coach, and he acted as an assistant coach for his father at Western Kentucky during his playing career. After retiring, Harbaugh was a quarterback coach for the Raiders (including their 2002 Super Bowl season, in which QB Rich Gannon was league MVP) and then became a college head coach. At San Diego, a non-scholarship school, Harbaugh developed Josh Johnson into an NFL player, and then at Stanford he turned Andrew Luck into one of the best QB prospects ever. But despite his proficiency developing quarterbacks, Harbaugh has shown an old-school offensive approach featuring two running backs and a tight end. That pro style will move to the NFL far easier than a spread offense would. Plus, Harbaugh hired Vic Fangio, a long-time NFL assistant, as his defensive coordinator, and if Fangio moves with Harbaugh, he can take advantage of San Francisco’s talented front seven by continuing to use a 3-4 system and tuning up the aggressiveness. And Harbaugh’s charismatic personality will sell some tickets, even if it doesn’t play as well with pro players as it did with collegians. The question of whether Harbaugh can make the leap from college to the NFL is still a big one – history does not look kindly on coaches making the move – although Harbaugh’s 17 years of NFL experience as a player and assistant at least give hope. San Francisco is gambling big on Harbaugh, and while it’s easy to see why he’s flavor of the month, for some reason our hopes for Harbaugh aren’t as high as the hype suggests. 6 – Jason Garrett, Cowboys – Garrett took over the Cowboys as an interim head coach at midseason, going 5-3 over the second half of the season after the Cowboys had just one win in the first half. Garrett’s greatest skill is offensive design, but he showed good motivational skills and rapport with players over the second half of the season. Dallas’ offense thrived under Garrett in the second half, but the defense needed a ton of help after Wade Phillips’ departure. Garrett needs to find a defensive coordinator for 2011, and those kinds of hires can make or break coaches. The good news is that Garrett has a ton of talent on both sides of the ball, especially premium talent like DeMarcus Ware, Anthony Spencer, Jay Ratliff, Miles Austin, Dez Bryant, and Jason Witten. The problems are the mid-level talent, as Dallas needs dependable guys, especially on the offensive line and in the secondary. To succeed, Garrett must avoid the tendency some offensive-minded coaches have to obsess over play-calling and run the whole team, much like Sean Payton does in New Orleans. But the offensive-defensive split we saw in Dallas over the second half of the season shows that such an attitude isn’t natural for Garrett yet. That’s a reason to be skeptical of his long-term success. 5 – Hue Jackson, Raiders – The Raiders made a strange decision by letting Tom Cable’s contract option expire after the head coach led them to an undefeated AFC West record and an eight-win season, the organization’s first year with more than five wins since their 2002 Super Bowl season. Since then, it’s become apparent that Cable and Raiders maven Al Davis were butting heads, as Davis so often does with his coaches. So Jackson is stepping into the least stable head-coaching post in the league, and one in which his contract will likely be disputed whenever his tenure is over. Still, it’s a first head-coaching job for a coaching lifer. He was an offensive coordinator in the Pac-10 at USC and Cal before moving to the NFL in 2001, and since moving to the pros he’s been a coordinator in Washington, Atlanta, and Oakland. Jackson has also been a running backs, wide receivers, and quarterbacks coach in the pros, and he’s respected at all three positions. Now Jackson must prove he can make the leap from calling plays and teaching technique to running an entire team. That’s the biggest leap for any new head coach, but at age 56 it’s now or never for Jackson to prove he can do it. We’re optimistic, despite the circus-like atmosphere around the Raiders, that Jackson can continue the progress for a Raiders team full of talent but usually inconsistent when it comes to performance. 4 – John Fox, Broncos – After a largely successful nine-year tenure in Carolina that ended poorly, Fox gets an immediate chance of redemption in Denver. He’s completely different than offensive-minded coaches Josh McDaniels and Mike Shanahan that have led the Broncos in the recent past. Fox is a nuts-and-bolts coach who plays conservatively on offense, depending on a running game, and aggressively on defense. That defensive emphasis will serve the Broncos well, because their inability to get anything done defensively doomed both McDaniels and Shanahan. With Elvis Dumervil returning in 2011, Fox will have a top-end pass rusher, but Dumervil has been a 3-4 player, and Fox has stuck with the 4-3 most of his career. If the Broncos change their system, it will slow down progress, but the front seven is so bereft of impact players that rebuilding is necessary either way. Fox’s other big decision right off the bat will be what to do at quarterback. Kyle Orton is a Fox type of QB, but the past Broncos’ regime invested so much in Tim Tebow that he needs to get a shot to play. However, Fox’s tendency in Carolina was to eschew young players in favor of more reliable veterans, even if they were less talented. That decision at quarterback will only impede Tebow’s development. And that’s the place where Fox’s tenure could break down. He’s a solid coach, but he must be more about development in Denver to rebuild a mediocre roster. Inexperienced Broncos exec John Elway and GM Brian Xanders will have to encourage and/or strong-arm Fox into playing young guys. If he doesn’t, it’s hard to see Denver climbing from its decline. 3 – Ron Rivera, Panthers – Rivera has long been a coaching bridesmaid – he’s been connected to at least 12 openings since 2006 – before he finally landed a head-coaching perch in Carolina. It’s easy to see why Rivera has drawn interest. He has been a successful defensive coordinator both in a 4-3 system (with Chicago) and a 3-4 (with San Diego). He’s learned from the hyper-aggressive Jim Johnson in Philadelphia and the conservative Lovie Smith in Chicago. So from an Xs and Os standpoint, he’s as versatile as defensive coaches come. He also has a strong personality who gets along with the media – he once was a Bears TV analyst – and should connect with fans. The question is whether he can fix the offensive problems that plague the Panthers. Carolina has decent defensive talent, and Rivera should help to unleash guys like Jon Beason and Everette Brown. But can Rivera fix the Panthers’ offensive problems? Can he hire the right offensive coordinator to either develop Jimmy Clausen or find a true quarterback of the future? These are questions that only time will answer. Rivera’s staff will be key to his success, and until those hires go through, Rivera’s uphill battle against Sean Payton, Mike Smith, and Raheem Morris in the NFC South looks even steeper. This is a solid hire by the Panthers, but the organization must let Rivera hire the offensive staff he needs or else success won’t be flowing Rivera’s way. 2 – Mike Munchak, Titans – Munchak, a Hall of Fame offensive guard, has been a part of the Titans organization since the Houston Oilers days. He was a top-10 pick, and in his 11-year career he made the Pro Bowl nine times. His No. 63 jersey is retired by the club. And since his retirement in 1993, he’s spent 17 years in the organization, the last 14 as the offensive line coach. He’s developed offensive linemen like Michael Roos, and the Titans have had stud offensive lines despite spending no first-rounders at the position. So he’s a good coach, and he’s a legend to owner Bud Adams. But can Munchak fill Jeff Fisher’s shoes? Fisher brought stability and toughness to the Titans, and that identity made them a strong defensive and running team throughout his tenure. Munchak should keep the same identity; the question is whether he can get better quarterback results than Fisher has since Steve McNair’s departure. And the leap from position coach to head coach skips the coordinator role, which is where coaches add and learn to manage many of the administrative duties that choke out many successful coaches. There will be an adjustment period for Munchak. So that begs the question: how will Adams deal with Munchak’s struggles? The head-coaching role will take the luster off of the greatest legend, and Munchak is risking his status in Adams’ eyes. If Adams is willing to be patient, Munchak has the traits to be a good head coach. But being under the thumb of an aging owner and not having a good quarterback answer don’t seem to be a recipe for success. 1 – Pat Shurmur, Browns – Shurmur, who has mentored Donovan McNabb and Sam Bradford, among other players, was Mike Holmgren’s choice to replace Eric Mangini as the head coach of the Cleveland Browns. Shurmur is different than Mangini – he’s an offensive coach, not a defensive coach, and he’s also got an extensive background in the West Coast offense under Andy Reid (another Holmgren protege). (Interestingly, both Shurmur and Mangini have ties to Bill Belichick, because Shurmur spent eight seasons under Belichick apprentice Nick Saban at Michigan State.) It’s clear that Holmgren was looking for a certain type of coach to take over the Browns. Shurmur faces a pretty tall task in Cleveland, because the offense has very few good pieces available. Peyton Hillis a workhorse running back, and the offensive line has terrific keystones in OT Joe Thomas and C Alex Mack. But the quarterback question is still open, as it’s impossible to know at this point whether Colt McCoy is a long-term answer. Holmgren believes Shurmur can find out, given Shurmur’s background developing quarterbacks with the Eagles and Rams. Shurmur was QB coach for the Eagles for seven years, not only helping McNabb perform, but also getting good performances out of lesser lights like an older Jeff Garcia, Koy Detmer, and A.J. Feeley. Then Shurmur became the offensive coordinator with the Rams, and this year he helped rookie Bradford develop very quickly. If Shurmur is to succeed in Cleveland, he must either develop McCoy or make a quick decision that he’s not the guy and move on. It seems like Shurmur is positioned to do that. But Shurmur appears to be Holmgren’s henchman in Cleveland, and the question is whether any head coach could survive with the walrus looming over his shoulder. Can Shurmur be his own coach, or will he be under constant pressure to make the decisions Holmgren would make? Perhaps a coach a with greater resume could, and maybe Holmgren’s family ties to Shurmur (Pat’s uncle Fritz was Holmgren’s long-time defensive coordinator in Green Bay) will aid the relationship. But we don’t feel great that Shurmur can be his own man enough to place his imprint on a Browns team badly in need of a long-term plan. The Carolina Panthers settled their head-coaching search Tuesday, agreeing to hire Ron Rivera as the franchise’s fourth head coach. Below are some thoughts on the hire; we’ll compare it to others thus far this offseason in a post later this week. Rivera has long been a coaching bridesmaid – he’s been connected to at least 12 openings since 2006 – before he finally landed a head-coaching perch in Carolina. It’s easy to see why Rivera has drawn interest. He has been a successful defensive coordinator both in a 4-3 system (with Chicago) and a 3-4 (with San Diego). He’s learned from the hyper-aggressive Jim Johnson in Philadelphia and the conservative Lovie Smith in Chicago. So from an Xs and Os standpoint, he’s as versatile as defensive coaches come. He also has a strong personality who gets along with the media – he once was a Bears TV analyst – and should connect with fans. The question is whether he can fix the offensive problems that plague the Panthers. Carolina has decent defensive talent, and Rivera should help to unleash guys like Jon Beason and Everette Brown. But can Rivera fix the Panthers’ offensive problems? Can he hire the right offensive coordinator to either develop Jimmy Clausen or find a true quarterback of the future? These are questions that only time will answer. Rivera’s staff will be key to his success, and until those hires go through, Rivera’s uphill battle against Sean Payton, Mike Smith, and Raheem Morris in the NFC South looks even steeper. This is a solid hire by the Panthers, but the organization must let Rivera hire the offensive staff he needs or else success won’t be flowing Rivera’s way. We’re still compiling our Football Relativity comparison of the opening weekend moves in the NFL’s free agent market, but we thought we’d give special attention to the most aggressive team of the opening day – the Chicago Bears. Here are thoughts on the Bears’ big moves signing DE Julius Peppers from Carolina, RB Chester Taylor from division rival Minnesota, and TE Brandon Manumaleuna from San Diego. The Bears, who don’t have a pick until the third round of this year’s draft, went whole hog in free agency and came up with their top three targets. The prize, of course, is Peppers, who’s still an elite pass rusher at age 30 and will make a huge difference for Chicago. The Bears had a bunch of so-so rushers but no studs, so Peppers provides that top-end rush and should help guys like Alex Brown be more productive across from him. Sure, Peppers isn’t always completely into games, but he still performs at a high enough level that he will help. He’s overpaid with $40 million coming in the first three years of his six-year deal, but the Bears had to overpay to lock him up. That made it worth it. On offense, Chicago added Taylor, who’s a solid all-around back who complemented Adrian Peterson in Minnesota. Now Taylor will earn more of a 50-50 split with Matt Forte, and Taylor’s pass-catching skills look to be a fit in Mike Martz’s new offensive scheme. Taylor is 30, which makes a three-year deal with $7 million guaranteed and $12.5 million total a little dicey, but he has always been a part-time player, which could extend his career a bit. Manumaleuna is a block-first tight end who better fits the new Martz scheme, which isn’t always great at protecting the passer. He got a five-year deal. Chicago’s spending spree is out of character, but the pressure is on head coach Lovie Smith and GM Jerry Angelo, and with no draft picks free agency was the only way to infuse talent into a mostly mediocre roster.